Hydro Royal is dedicated to developing and manufacturing the finest heat pumps to conserve energy and protect the environment. With a quarter of a century of production of heat pumps, Hydro Royal has set the standard. Hydro Royal's test facility rigidly checks each heat pump during every step of manufacturing. All units are run-tested to assure efficiency and reliability. Quality is assured through Hydro Royal's years of experience, research & development and continuous testing. Hydro Royal Pool Heat Pump HR Series in stock! Ships out same day if order placed before noon EST. Models available in 60 Hertz, Single Phase and 220 Volts. Please contact us for 3 Phase option or 50 Hertz. 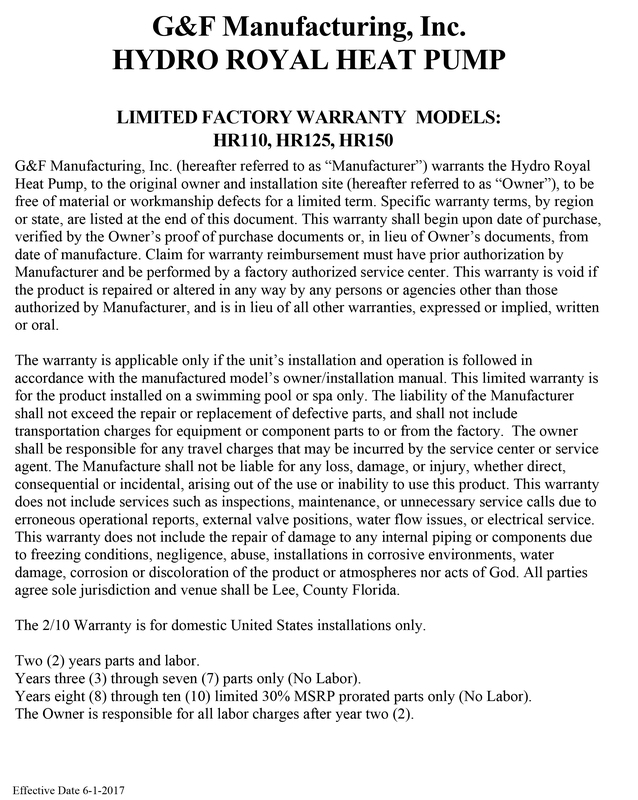 Manufacturer's Warranty valid in Continental USA. All others please contact us for warranty information. For other size options or chiller options please contact us. State-of-the-art LCD readout control. Displays mode and temperature of the water for ease of operation. No programming to learn. Dual thermostats allow user to set pool, spa or tank temperatures. The control is self-diagnostic and will display a fault if there is a problem. Other features include: lockout, spa timer, automatic low temperature defrost and remote control capabilities. The unit is equipped with a low RPM fan motor in combination with a deep drawn venturi to ensure whisper quiet operation. The heat pump utilizes the latest in compressor technology to produce the highest efficiency available when coupled with the over-sized enhanced fin evaporator coil. The unit is equipped with easy-to-install, hand-tightened unions for a quick and trouble-free installation. The unions will accept 2" PVC piping. The electrical connection is made with one entry directly into the control box for a quick hook-up and a neat appearance. The heat pump was designed for quick and easy access for installation and diagnosis. The service panel is removed with two screws and access to all service connections is right up front and easy to reach. This allows the installation and service to be done quickly and efficiently - so valuable time is not wasted. 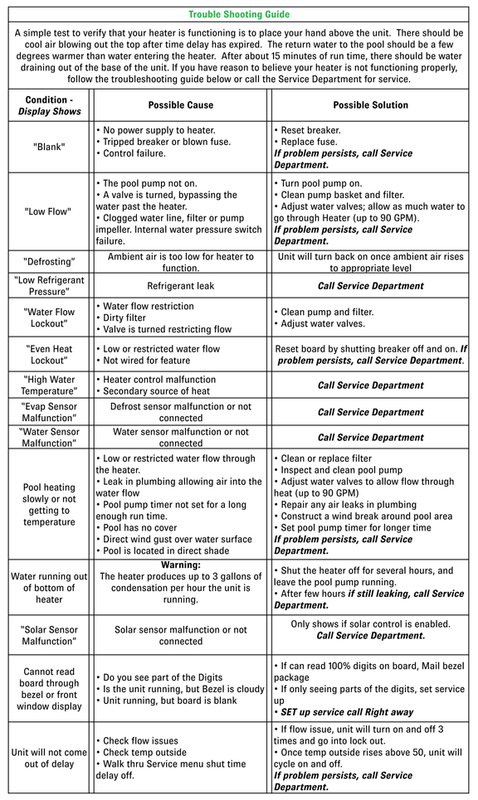 Why Should I Choose A Hydro Royal pool heat pump? Hydro Royals are made in North Fort Myers, Florida by G&F Manufacturing. They are a third generation family run company and have been heating pools for over 25 years. Meets and Surpasses ARI Testing Standards! Avoids corrosion and has coated components for salty environment applications. Hydro Royals have a quiet scroll compressor. The commercial grade fan motor has been designed for quiet operation. Only 56db while in operation. Best Warranty in the market! Excellent customer service! 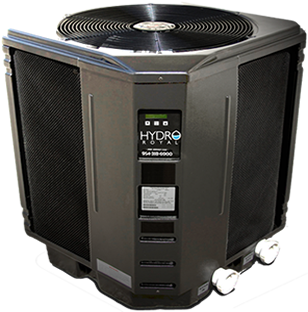 Hydro Royal HR Series of pool heat pumps offers a limited 2/10 factory warranty. BECAUSE ALL SWIMMING POOLS AREN’T BUILT EQUALLY, WE KNOW THAT NEITHER ARE THEIR OWNERS. We all have different needs that have to be considered so that we make sure your pool is warm and your family is comfortable and happy. If you have a swimming pool with a unique design, or the pool is built on terrain, higher or lower than the house ground level or maybe you have a very large swimming pool with a spa or water feature attached? Perhaps you need your swimming pool to have a very specific temperature because you use it for medical reasons or need to exercise an all kinds of weather? Maybe you have an indoor pool? For any of the reasons mentioned above or maybe some conditions that we didn't cover. We are here to help. My name is Marcus Miller and I’m a heat pump professional with over 38 years of experience in heating and cooling air and water. I can help you choose the right pool heat pump for your specific needs. You can talk to me directly on my cell at 360 348 7574 or text so we can chat. marc@heatpumpheroes.com Who is Marcus Miller? We invite you to contact us for more information, advice and help. At heatpumpsuppliers.com we understand that your aqua cultural heat pump application will be unique and that it will need to be tailored to your specific needs. We will work in constant direct contact with the factory engineers to help you design the best possible system for your application. We are ready to assist you.